The Bisons are off to a red-hot start in their first season as a Blue Jays affiliate -- they began play Monday with an 11-4 record and a .320 team batting average -- with first baseman Jimenez providing a big boost. The 30-year-old's 16 RBIs are third-most in the IL despite coming in just 12 games. Jimenez drove in eight runs -- one shy of the Buffalo team mark -- in the Bisons' record-setting win at Syracuse Thursday while going 5-for-7 with a three-run homer. That's a pretty good week in one day, but Jimenez added hits in four of his other five games as Buffalo went 7-0 for the week. After batting just .123 in 22 games with the RedHawks last season when he came over from the Diamondbacks organization, Krauss seems to be settling in to the PCL very nicely. The 25-year-old Ohio native is riding a 10-game hitting streak during which he's driven in 15 runs. Nine of Krauss' 16 hits have gone for extra bases and his 18 RBIs are fifth-most in the PCL. Krauss seems to feel completely at home at Chickasaw Bricktown Park, where he's hitting .423/.469/.769 with 13 RBIs in eight games. Trenton's season has been up-and-down thus far -- the Thunder followed a five-game winning streak with a four-game slide that ended Saturday -- but Roller has been a model of consistency. The 25-year-old East Carolina product has collected multiple hits in each of his last six games and RBIs in each of his last four. Roller's 24 hits and four home runs are the most in the Eastern League, and his 6-for-10 weekend helped Trenton beat Erie twice to snap its losing streak. A left-handed hitter, Roller has been particularly dangerous against southpaw pitchers, having gone 9-for-19 with two homers so far this season. After going 0-for-7 in his first two Double-A games, Pederson is riding a 15-game hitting streak and is tied for the Southern League lead with five home runs. MLB.com's No. 84 prospect also ranks third on the circuit with six stolen bases and has yet to be thrown out. Pederson homered twice and drove in four runs against Birmingham on Wednesday and has struck out just nine times while drawing six walks. It's been a thoroughly impressive start in Double-A for Pederson, who turned 21 on Sunday. A second-round pick out of the University of Arkansas in 2010, Eibner got off to a disastrous start upon his return to the state this month, going 0-for-20 with 10 strikeouts in his first five Double-A games. Finally notching his first hit on April 12, Eibner really got going this week by collecting at least one hit and scoring at least one run in each of his six games and lifting his batting average nearly 200 points. Eibner's four walks and .283 on-base percentage remain subpar, particularly for a leadoff hitter, but another week or two like this one will place him amongst the league's leaders. Orr did not have a good year in 2012, his first full season, hitting .211/.300/ .419 in 79 games for Class A Fort Wayne. Whatever he did during the offseason should be patented, however, as Orr has begun the 2013 campaign on an utter tear. The 24-year-old is hitting .436/.492/.873 -- best in the Cal League in all three categories -- in his first 15 games with the Storm. Orr went 4-for-5 with a triple and double against Rancho Cucamonga on Tuesday and wrapped up the week by going 8-for-13 with three homers and seven RBIs in three games at Visalia. Washington's No. 20 prospect, Martinson had mixed results in 2012: though he hit 22 home runs and was one of only two Minor Leaguers to collect at least 100 RBIs and 100 runs scored, he hit only .215 with a .279 on-base percentage after a midseason promotion to Potomac. There's been nothing mixed about his 2013 performance, though. The Texas State product homered, doubled and drove in four runs against Frederick on Thursday and has driven in a league-leading 15 runs in 16 games. Though Martinson's 24 strikeouts are second most in the league, he ranks fifth with a .425 on-base mark. The Florida State League is generally considered a pitchers' circuit, but Manatees catcher Cameron Garfield doesn't seem to have gotten that memo. The 21-year-old went deep four times from Tuesday to Friday this week and is one off Miguel Sano's FSL-leading six. After hitting 11 homers and driving in 33 runs for Class A Wisconsin last season, Garfield is well on his way to eclipsing those numbers early on in 2013. A 25th-round pick in 2011, Shoulders has until now been primarily known for his name, which won MiLB.com's 2012 Moniker Madness showdown. He's drawing attention more for his bat this season, however. Shoulders leads the Midwest League with four homers, 25 hits, a .424 batting average and .695 slugging percentage. The Florida native had hits in each of his six games this week and homered in both games of the Cougars' doubleheader sweep of Quad Cities on Friday. Shoulders has thus far saved his best work for the home fans at Fifth Third Bank Ballpark, where he's hitting .512 with 11 RBIs in his first 11 games. The Crawdads' lineup was expected to be potent this season, featuring Rangers prospects like Joey Gallo, Jorge Alfaro and Lewis Brinson. Eclipsing them all -- along with much of the rest of the Sally League -- so far has been Williams, who leads the circuit with seven homers and is tied for third with 16 RBIs. A second-round pick in last June's Draft, Williams was solid in 48 games with the Rangers' Arizona Rookie League affiliate. In his full-season debut, however, the 19-year-old outfielder is slugging .676 -- up from .448 in 2012. 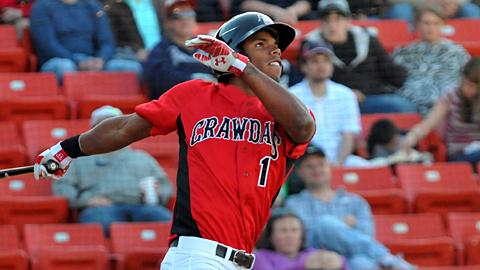 With four blasts this week, Williams has led the Crawdads to a seven-game winning streak and a share of first place in the Northern Division.